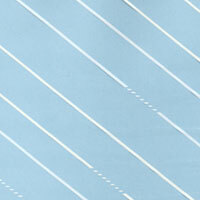 White Diagonal Stripes and Dashes Cellophane Roll 24 inches wide x 50 ft long. The white diagonal lines are solid except every other one or so have an area of dotted line in the design. Very classy look. Background is clear and only shown in blue here so you can see the white design online.